Mercer County Executive Brian M. Hughes today announced that for the first time in its 85-year history, Trenton-Mercer Airport will offer international service. Beginning on Nov. 20, Frontier Airlines will offer non-stop service to Nassau, Bahamas. Flights to Nassau will be offered twice weekly on Thursdays and Sundays. To celebrate the announcement, Frontier is offering fares starting at $79 each way to Nassau for tickets purchased through Aug. 23. The special offer, which begins at 10 a.m. Aug. 19, is only available through the airline’s website at www.flyfrontier.com. Daniel Shurz, a senior vice-president with Frontier, said the airline is excited to expand at Trenton-Mercer Airport again and offer the first international destination. Two weeks ago, Frontier announced that it was adding West Palm Beach to its Florida destinations. The addition of Nassau brings the total number of destinations Frontier serves from the Trenton-Mercer Airport to 18. The airline previously offered nonstop flights to Columbus and New Orleans, but then eliminated those routes. 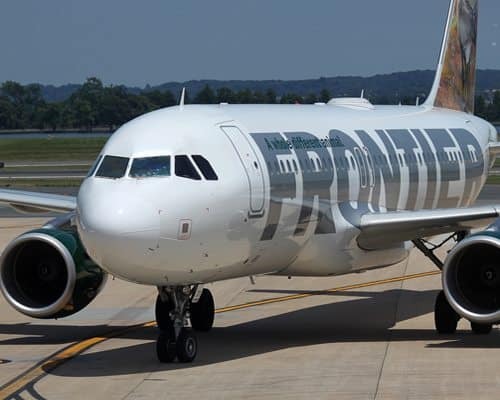 All Frontier flights from Trenton-Mercer operate on 138-seat Airbus 319 aircraft. For more information about flights, visit FlyFrontier.com. Thank you Frontier Airlines! This is so civilized I just may go back to flying.